The Disease Outbreak Control Division provides a number of resources for healthcare providers, from updates and advisories, to resources on influenza, vaccinations, antimicrobial resistance, disease information, and other important topics. Healthcare providers can use the DOCD website to report illnesses, obtain information about programs such as Stop Flu at School, and learn about other issues of importance to healthcare providers in Hawaii. Measles Outbreaks Occurring in Multiple States Across U.S. Adults born in 1957 or later should have at least one documented dose of MMR vaccine. Post-secondary school students, healthcare workers, and international travelers should have two documented doses of MMR vaccine. Health officials in Japan have reported an outbreak of rubella. Most cases continue to be reported in the Kanto region (Tokyo, Kanagawa, Chiba, and Saitama). Travelers to Japan should ensure they are vaccinated against rubella with the MMR (measles, mumps, and rubella) vaccine before leaving the United States. Rubella infection during early pregnancy may have serious consequences, including miscarriages, stillbirths, and severe birth defects in infants (Congenital Rubella Syndrome). Pregnant women who are not protected against rubella through either vaccination or previous rubella infection should not travel to Japan during this outbreak. Clinicians should keep rubella in mind when treating patients with fever and rash, especially if the patient has recently traveled internationally. Since August 2014, CDC has received an increased number of reports of people across the United States with Acute Flaccid Myelitis (AFM). To date, no cases of AFM have been diagnosed in Hawaii. Difficulty with swallowing or slurred speech. The most severe symptom of AFM is respiratory failure that can require urgent ventilator support. The cause of most AFM cases is not currently known, although possibilities include viruses, environmental toxins, and genetic disorders. For reasons that are not clear, most cases have occurred in children. If you suspect you have a patient with AFM, please contact the Hawaii Department of Health at (808) 586-4586. For more information regarding AFM, visit the CDC’s clinician information page at https://www.cdc.gov/acute-flaccid-myelitis/hcp/index.html. 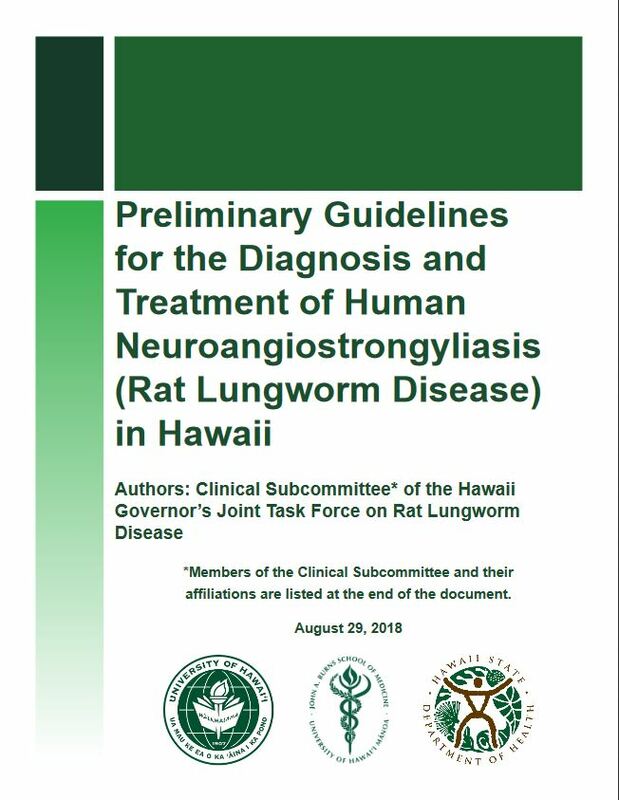 The Clinical Subcommittee of the Hawaii Governor’s Joint Task Force on Rat Lungworm Disease has published its report, “Preliminary Guidelines for the Diagnosis and Treatment of Human Neuroangiostrongyliasis (Rat Lungworm Disease) in Hawaii”. The full document can be read here; below are the key points of the report. Clinicians in Hawaii should have a high index of suspicion for neuroangiostrongyliasis. Suspect cases should be discussed with the Department of Health (DOH) Disease Investigation Branch (DIB) at the earliest opportunity to facilitate prompt, accurate diagnosis and appropriate patient management. Call (808) 586-4586 for the Disease Reporting Line. Typical symptoms in adults include severe headaches, neck stiffness, nausea, paresthesias, and limb pains. Highly suggestive symptoms include migratory hyperesthesias, cranial nerve abnormalities, ataxia, and focal neurologic findings which are migratory or do not follow a dermatomal distribution. Typical symptoms in children include fever, abdominal pain, vomiting, irritability, poor appetite, muscle weakness, fatigue, and lethargy. Lumbar puncture (LP) is an essential part of the evaluation of suspected neuroangiostrongyliasis. It is a low-risk procedure and has therapeutic benefits, including relief of headaches, nausea, and vomiting. An exposure history, which includes residence in or recent travel to an endemic area. Eosinophilic meningitis is the hallmark of the disease and is defined as the presence of 10 or more eosinophils per μL of CSF and/or eosinophils accounting for more than 10% of CSF white blood cells when there are at least 6 total WBC per μL in CSF. CSF eosinophil counts may be absent or low early in the course of the disease, requiring repeat LPs if neuroangiostrongyliasis is still suspected. Real-time polymerase chain reaction (RTi-PCR) of CSF for A. cantonensis DNA is the best way to confirm the infection and is available in Hawaii through the DIB or from the Centers for Disease Control and Prevention (CDC) for the rest of the United States. CSF RTi-PCR may be negative in the early stages of infection. Repeat LP and testing is indicated if neuroangiostrongyliasis is still suspected. Baseline studies should include a complete blood count (CBC) with differential, serum electrolytes, liver function tests, renal function tests, blood glucose, urinalysis, and chest x-ray. Peripheral eosinophil counts of ≥ 500 cells/μL are often present during the course of the illness but may be absent. Magnetic resonance imaging (MRI) of the brain, although not required, may be helpful in diagnosing suspected neuroangiostrongyliasis. Focused MRI of the spine may be appropriate if indicated by clinical presentation. Serological tests for antibodies against A. cantonensis in the serum or CSF are not recommended for the diagnosis of neuroangiostrongyliasis. High dose corticosteroids have been shown to improve clinical outcomes. Start corticosteroids as soon as a presumptive diagnosis of neuroangiostrongyliasis is made and assuming no contraindications. Individuals with diabetes or glucose intolerance should be closely monitored. Modifications to the patient’s diabetes medications may be needed. The addition of albendazole, an anthelminthic drug, may provide additional benefits, although there is limited evidence of this in humans. If albendazole is used, combine with corticosteroids to blunt any possible increase in the inflammatory response to dying worms. Careful clinical monitoring is recommended in all patients, and specialist consultation (e.g., infectious disease, neurology, etc.) may be advisable. Pain management may require early consultation with a pain specialist. The Hawaii State Department of Health (DOH) is currently investigating cases of Legionella on Oahu. Legionellosis is caused by the bacterium, Legionella. People typically get sick 2-10 days after they breathe in tiny droplets of water in the air containing the bacteria. During the current mumps outbreak in Hawaii, in addition to routine vaccination recommendations, adolescents (aged 10-19 years) and adults (born in 1957 or later) should receive an additional MMR vaccine dose now. The outbreak dose should be separated from administration of a previous mumps-containing vaccine by a minimum interval of 4 weeks. A person should receive no more than 3 total doses of mumps-containing vaccine. For more information about the mumps outbreak in Hawaii, visit http://health.hawaii.gov/docd/department-of-health-investigating-mumps-cases/. Since December 2016 there has been an ongoing outbreak of yellow fever in several states in Brazil. In response to the outbreak, the Centers for Disease Control and Prevention (CDC) has issued a travel alert (Level 2, Practice Enhanced Precautions) for certain areas of the country. It is recommended that anyone 9 months or older that are traveling to these areas should be vaccinated against yellow fever. People who have not been vaccinated should not travel to areas with ongoing outbreaks. Booster doses of yellow fever vaccine are no longer recommended by CDC for most travelers, however, booster doses may be given to travelers who received their last dose of yellow fever vaccine at least 10 years ago and who will be traveling to high-risk settings. Travelers should consult with a yellow fever vaccine provider to determine if they should be vaccinated. For updated information on the outbreak, including identification of affected areas in Brazil and CDC recommendations, visit CDC’s Travelers’ Health page – Yellow Fever in Brazil. For more information on yellow fever, go here.